I thought this was a very nice foundation. It provides good coverage, I'd say medium to full coverage. Applies very smoothly and evening. 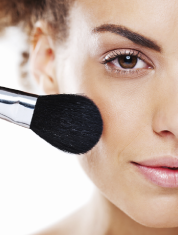 Feather it out with a makeup sponge to soften any heavy spots. It will begin to shine after awhile so I'd suggues applying a light powder to blur the shine. Softened the look of fine lines and age spots/freckles. Nice one to have in your foundation collection. Didn't cause any breakouts. Love the pump. However, I wouldn't categorize this as a foundation. It doesn't have the same texture but feels thick like a tinted moisturizer or BB cream. Applies very blotchy to me. There is also very limited color selection similar to how BB creams are. This leaves my face really "radiant" hence the name but since I have oily skin, that's the last thing I need. I would suggest this for dry skin...read more but not so much on oily skin. This stuff would rub off and make you look like a greaseball within an hour. Looks great when you first put it on, but if you have even a slight touch of an oily complexion, this stuff slides right off your face. It's a gradual process....after it shines up...it slides off. Feels icky on your skin too.